Thallus: continuous to fissured or fissured-areolate, with thin to moderately thick; margins: entire, unzoned upper surface: yellow-gray to yellowish green, smooth to tuberculate, shiny or dull, slightly pruinose; lacking soredia or isidia fertile verrucae: concolorous with thallus, ampliariate to pertusariate, numerous, c. 0.4-1.6 mm in diam. ; ostioles: 1-7 per verruca, hyaline or concolorous with thallus, level to sunken, rarely fusing to form a pseudolecanorate disc Apothecia: 1-6 per verruca; epithecium: hyaline to brown, K-; hypothecium: hyaline asci: cylindrical, 145-300 x 38-68 µm, mostly 2-spored ascospores: hyaline, ellipsoid to cylindrical, 65-150 x 30-52 µm; spore wall: 2-layered; outer spore wall: c. 1-6 µm thick; inner spore wall: 2-10 µm thick, rough; apices: up to 28 µm thick Pycnidia: not seen Spot tests: K+ yellow, C+ orange, KC-, P+ yellow to orange, UV+ orange-red Secondary metabolites: stictic and thiophaninic acids (both major), constictic acid, 2-chloro-6-O-methylnorlichexanthone, and 4-chloro-6-O-methylnorlichexanthone (all minor). Substrate and ecology: Pertusaria xanthodes is a corticolous species occurring on several trees, such as Beaucarnea, Fouquieria, Jatropha, Pinus, Pittosporum, Prosopis, and Quercus at the coast or in coastal mountains World distribution: North America and Bermuda Sonoran distribution: coastal California, Baja California, Baja California Sur, Sonora and Sinaloa mainly at 0-400 m. Notes: Pertusaria xanthodes is characterized by a yellowish thallus, poriform apothecia with hyaline ostioles that do not dilate, 2-spored asci, rough inner spore wall, and the production of stictic and thiophaninic acids. It is easily confused with P. texana and the differences are discussed above. Another similar species is P. pustulata and a full discussion of these two species is listed by Dibben (1980: 120). 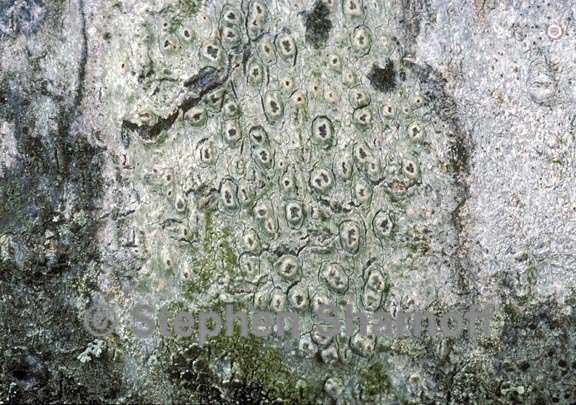 The most conspicuous characters to distinguish the two species are the ostioles (rarely fused in P. xanthodes, often fused in P. pustulata), the spore wall (rough in P. xanthodes, smooth in P. pustulata), and the chemistry (thiophaninic acid in P. xanthodes, 2-chloro-6-O-methylnorlichexanthone in P. pustulata).